Our School was established in December 2009, and we became a Nevada Non-Profit School on July 1st, 2011. Now we're a federal 501(c)(3) Music School. Our mission is to provide quality music education to children and adults in Northern Nevada communities, and help those who are underprivileged, needy, at risk, and under-served to obtain private and group lessons, instruments and equipment, and experience a variety of music performances. We will give back to our community by performing in various venues in the area. We had a wonderful year at Aria. We were able to give scholarships to 3 students, and reduced cost lessons to 4 students. We helped 4 students with instruments, books and accessories. We continued to offer low cost workshops and group classes, as well as affordable private lessons. We teamed with Truckee Meadows Community College to have a beginning ukulele group class for the fall, spring, and summer semesters. We have 2 other ongoing uke classes for intermediate and advanced students. We have a weekly strum and sing group for ukulele players. We teamed with TMCC to have a beginning Mandolin class for the spring semester. We volunteered and performed at the yearly Reno Ukulele Festival, and Julie Holloman was one of the instructors there. We also did a free ukulele concert for Artown. We performed for the JACL, church functions, and other venues.. Our students did 4 Open Mic performances, and 2 Recitals at the school. Tuesday Jan. 31: Spring Semester "Beginning Ukulele Class" started. Aria teamed with TMCC for these classes, and we had 23 students attending. Thursday Feb.2: Spring Semester "Beginning Mandolin Class" started. Aria teamed with TMCC for these classes, and we had 8 students attending. 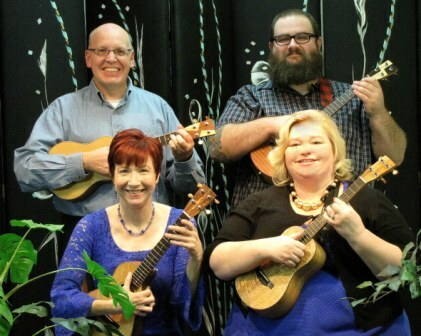 Friday Feb.10: Reno Ukulele Group performed for the First Baptist Church Valentines Party. There were 100 partygoers. Tuesday February 21-Saturday February 25: Julie Holloman taught 2 Flamenco Workshops at the Palm Strings Uke Fest., and Julie and Danielle Hunt performed with the Luongo Ukulele Ensemble there. 500 people attended the event. Sunday March 5: Uklear Fusion performed for the JACL Luncheon at the Washoe Co. Senior Center. 150 people attended. Saturday March 11: The Luongo Ukulele Emsemble gave a free concert at 2:30 for 40 guests. Wednesday March 22: Aria had an Open Mic Night from 6:30-8:00 p.m. 16 students performed for an audience of 35 people. Saturday March 25: Aria hosted a Luongo Ukulele Ensemble rehearsal with Peter Luongo at 2:00 via Skype and Facebook for 26 ensemble members. Wednesday April 5-Sunday April 9: 9th Annual Reno Ukulele Festival at the Nugget. Evan and Julie volunteered. Evan helped run the Open Mic stage, which was ongoing. On Friday April 7 Evan and Julie performed in their group Aria 51 at 11:30, and Evan, Julie, and Danielle performed in their group Ukelear Fusion @ 1:30. Julie taught 3 Flamenco on Ukulele workshops on Friday and Saturday. Julie and Danielle helped Peter Luongo with his LUE test drive Workshops, rehearsed with LUE daily, and performed with the Luongo Ukulele Ensemble in the Celebrity Ballroom at the Concert on Satursday April 8 At 8:00 p.m.. Over 600 people participated in classes and attended concerts. Tuesday May 9: Summer Semester "Beginning Ukulele Class" started. Aria teamed with TMCC for these classes, and we had 13 students attending. Saturday June 3: Aria School Recital @ 6:00 at Aria, which featured students on cello, guitar, piano, violin, voice, mandolin, and ukulele. 14 students participated. There were 40 people in the audience. Wednesday June 21: Aria had an Open Mic Night from 6:30-8:00 p.m. 17 students performed for an audience of 35 people. 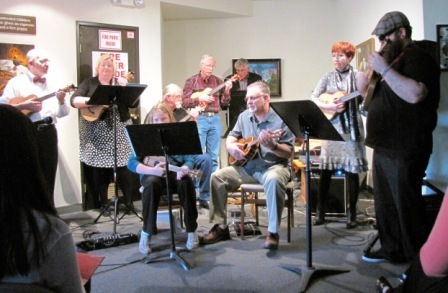 Wednesday July 12: Reno Ukulele Group performed for the annual Aria Artown Uke Concert at 6:00 at Nightengale Concert Hall. They were joined by the Halau Hula O Leilani Dancers for 3 songs. There were 300 audience members in attendance. Saturday August 26: Evan and Julie did a Hawaiian Uke Workshop at the second Aloha Festival in Reno. There were 18 students who attended, and they learned to play 3 chords and several songs in 1 hour. Tuesday September 5: Fall Semester "Beginning Ukulele Class" started. Aria teamed with TMCC for these classes, and we had 16 students attending. Wednesday September 20: Aria had an Open Mic Night from 6:30-8:00 p.m. Ten students performed for an audience of 21 people. 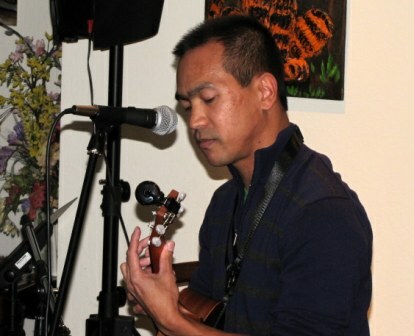 Saturday September 23: Aria hosted Ukulollo Lorenzo Vignando and friends for a free Concert at 7:00. Best concert we ever saw! Wednesday September 27: Aria hosted Jim D'Ville teaching 2 play by ear Workshops: 5:30 " Learning Songs the Fun Way", and 7:00 "Magical Mystery Chords." 33 students attended. Saturday October 7: Aria School, participating in Kids Music Day, had a Recital @ 6:00 at Aria, which featured students on cello, guitar, piano, violin, voice, and ukulele. 12 students participated. There were 55 people attending this fun event. Wednesday November 29: Reno Ukulele Group went Christmas Caroling at Meadowood Mall from 6:30-7:30 at Santa's Workshop. 100 people were there visiting Santa and singing along. Wednesday December 20: Aria had an Open Mic Night/Christmas Party from 6:30-8:00 p.m. The night began with a group sing. 6 students performed for an audience of 55 people. The String Quartet "Nerds of Paradise", which includes Evan Stern, did their first concert. Everyone enjoyed yummy treats, and many people had their portraits done by Mark Holloman Photography. We continued to offer low cost workshops and group classes, as well as affordable private lessons. We teamed with Truckee Meadows Community College to have a beginning ukulele group class each semester. We have 2 other ongoing uke classes for intermediate and advanced students. We teamed with TMCC to have a beginning Mandolin class for the fall semester. We performed at assisted living homes each quarter. We volunteered and performed at the yearly Reno Ukulele Festival, and Julie Holloman was one of the instructors there. We also did a free ukulele concert for Artown. We performed for the Senior Dimensions Health Fair. Our students did 4 Open Mic performances, and 2 Recitals at the school. Saturday Jan. 23: Evan and Julie did a Strum Workshop from 9:30 - 11:00. 19 students attended and learned tips and techniques to improve their strumming skills. Tuesday Jan. 26: Spring Semester "Beginning Ukulele Class" started. Aria teams with Truckee Meadows Community College for these classes, and we had 14 students attending. Saturday Feb.20: Aria School Recital @ 6:00 at Aria, which featured students on cello, guitar, piano, violin, voice, mandolin, and ukulele. 28 students participated. There were 60 people in the audience. Wednesday March 9: Reno Ukulele Group performed at Sky Peaks Assisted Living from 6:30-7:30. 35 Residents attended the concert and sang along. Saturday March 19: Evan and Julie did a Ukulele Fingerstyle Workshop from 9:30 - 11:00. 25 students attended and learned the basics of finger picking arpeggios for accompanying songs, and a variety of patterns to use. Wednesday March 23: Aria had an Open Mic Night from 6:30-8:00 p.m. Ten students performed for an audience of 35 people. Thursday April 14-Sunday April 17: 8th Annual Reno Ukulele Festival at the Nugget. Evan and Julie volunteered. Evan helped run the first Radio broadcast of the Open Mic performances, which was ongoing. Evan, Julie, Rich and Danielle performed in their group Ukelear Fusion on Saturday Apr. 15 @ 4:30. Julie taught 3 Flamenco on Ukulele workshops on Friday and Saturday. Julie performed at the open Mic venue twice, and Danielle performed once. Over 400 people participate in classes and attend concerts. 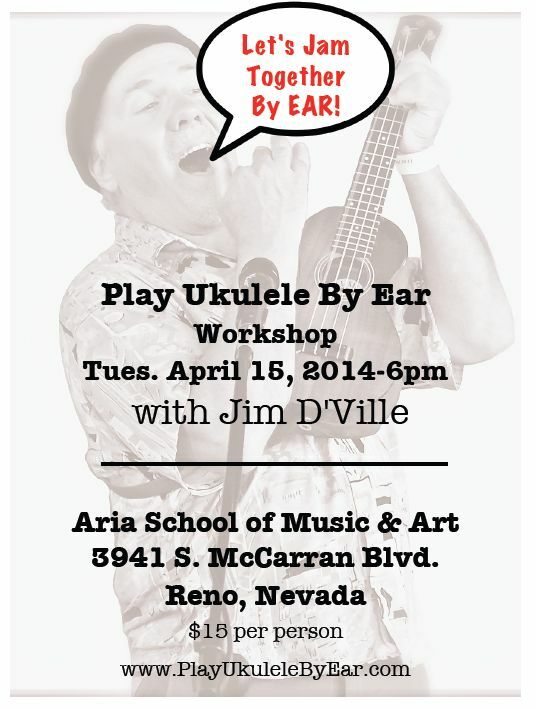 Saturday May 21: Jim D'Ville did two of his famous play-by-ear workshops at 9:30 and 11:00 at Aria. We had 28 students attend and enjoy both workshops. Friday May 27: Reno Ukulele Group performed at Marvin Piccolo School at 12:30 for their Prom. There were 100 students, families, and staff attending the event. Wednesday June 8: Reno Ukulele Group performed at Sky Peaks Assisted Living from 6:30-7:30. 30 Residents attended the concert and sang along. Wednesday June 22: Aria had an Open Mic Night from 6:30-8:00 p.m. Twelve students performed for an audience of 35 people. Tuesday July 12: Reno Ukulele Group performed at the Senior Dimensions Health Fair at the Grand Sierra Resort at 11:30. There were 50 vendors and seniors attending. Wednesday July 13: Reno Ukulele Group performed for the annual Aria Artown Uke Concert at 6:00 at the Laxalt Auditorium. They were joined by the Halau Hula O Leilani Dancers for 2 songs, and guest artist Sean Holloman on Didgeridoo for the closing song. There were 250 audience members in attendance, which was standing room only. Time for a bigger venue! Wednesday July 20: Aria sponsored the group Kannekoa, a folk/reggae/rock group from Hawaii, to do a Hawaiian Workshop at Aria at 6:30. There were 17 students in attendance. Saturday August 27: Evan and Julie did a Hawaiian Uke Workshop at the first Aloha Festival in Reno. There were 12 students who attended, and they learned to play 3 chords and 2 Hawaiian songs in 1 hour. Wednesday October 5: Aria had an Open Mic Night from 6:30-8:00 p.m. Thirteen students performed for an audience of 21 people. Wednesday November 2: Reno Ukulele Group performed at Summit Estates Assisted Living from 6:30-7:30. 20 Residents attended the concert and sang along. Saturday November 19: Aria School Recital @ 6:00 at Aria, which featured students on cello, guitar, piano, mandolin, voice, and ukulele. 22 students participated. There were 55 people attending this fun event. Wednesday December 7: Reno Ukulele Group performed at Summit Estates Assisted Living from 6:15-7:15. 35 Residents, family and workers attended the concert and sang along. Wednesday December 14: Aria had an Open Mic Night/Christmas Party from 6:30-8:00 p.m. The night began with a group sing. Twenty students performed for an audience of 50 people. Everyone enjoyed yummy treats, and many people had their portraits done by Mark Holloman Photography. We had a wonderful year at Aria. We were able to give scholarships to 3 students, and reduced cost lessons to 3 students. We helped 4 students with instruments, books and accessories. We continued to offer low cost workshops and group classes, as well as affordable private lessons. We teamed with Truckee Meadows Community College to have a beginning ukulele group class each semester. We went from 3 ukulele classes to 4. We performed at assisted living homes each quarter. We volunteered and performed at the yearly Reno Ukulele Festival, and Julie Holloman was one of the instructors there. We also did a free ukulele concert for Artown. TUESDAY JAN 27: Spring Semester Beginning Ukulele class started. 7 students took the class. SATURDAY JAN 31: Strum Workshop. 10 students participated. SATURDAY FEB 21: Aria Fundraiser @ Fuego Restaurant. 50 people attended. $950.00 was raised to help pay for air conditioner repair. WEDNESDAY MAR 18: Open Mic Night, 6:30-8:00. 13 students participated, 10 family members cheered them on..
WEDNESDAY APR 14: Reno Ukulele Group (RUG) performed at Sky Peaks Assisted Living. 18 RUG members performed, and 35 residents watched. THURSDAY APR 30 TO SUNDAY MAY 3: Reno Ukulele Festival at the Nugget in Sparks. Rich Dann helped organize the event. Julie Holloman and Evan Stern helped each day. Ukelear Fusion (Aria School ukulele quartet) performed on Sat. May 2 at 12:00. Julie taught 2 Flamenco Ukulele Workshops. 350 students from all over the country took classes, and approx. 5,000 people attended the event. WEDNESDAY MAY 20: Open Mic Night, 6:30-8:00. 14 students performed and 25 family members and friends watched and emjoyed. SATURDAY JUNE 13: Aria School Recital @ 6:00. 9 Private Lesson students and 3 Group Classes performed, for a total of 24 students. 22 friends and family members watched. WEDNESDAY JULY 15: Aria School Ukulele Concert for Artown from 6:00 - 7:30 @ the Laxalt Theater. 22 students and 2 teachers performed, and 9 hula dancers from the Halau Hula O Leilani. The theater has 215 seats, and it was standing room only with a total of approximately 250 audience members. WEDNESDAY AUGUST 19: Open Mic Night 6:30-8:00. 13 students performed and 20 family members cheered them on. TUESDAY SEPTEMBER 1: Fall Semester Beginning Ukulele class started. 12 students took the class. WEDNESDAY OCTOBER 28: RUG Halloween/Thanksgiving performance at Sky Peaks Assisted Living. 15 RUG members performed for 30 residents. SATURDAY NOVEMBER 14: Benefit Concert @ 7:00 by Aria 51 & Ukelear Fusion at Aria. 10 people attended and $260.00 was raised for the Scholarship Fund. THURSDAY MOVEMBER 19: RUG played at 11:00 for the Senior Dimension Health Fair at the Grand Sierra Resort. 16 RUG members performed, and approx. 250 people enjoyed the music. SATURDAY NOVEMBER 21: RUG performed at Play Your Own Music in Carson City @ 1:00. Approx. 60 people cheered them on. 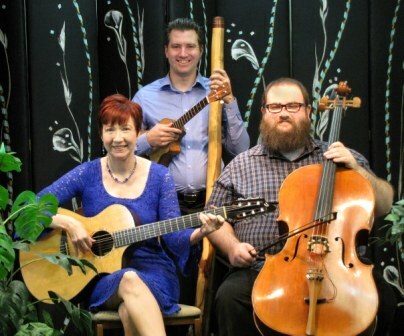 WENESDAY DECEMBER 9: RUG Holiday performance at Sky Peaks Assisted Living @ 6:30. 14 RUG members performed for 16 residents. WEDNESDAY DECEMBER 16: Aria Open Mic Night/ Christmas Party from 6:30-8:00 @ Aria. Ukelear Fusion perforned, followed by 12 students. 38 people attended and enjoyed the music, treats, and social time. In 2014 Aria was able to help 6 students receive private music lessons at a reduced rate or no cost to their families. We provided books, strings, and instruments to 7 students at no cost to their families. We were able to reach out to at least 1000 people by performing in the school and in many venues in the community. Aria files a 990N (postcard) with the IRS. This is for non-profits that bring in less than $50,000.00 per year. Saturday March 22nd there was a School Recital featuring cello, guitar, piano, violin, voice, & ukulele students. The staff groups Ukelear Fusion and Aria 51 performed too. As always, we had yummy treats afterward, and everyone had fun. There were 55 people there! Tuesday April 15th we enjoyed tax relief with Jim D'Ville. He did a PLAY UKULELE BY EAR workshop. There were 15 of us, and we were jamin'! Friday April 18th Aria 51 performed 2 shows at Mount Rose Elementary School, with a student body of 650. 1:15 was for grades K-3, and 1:45 was for grades 4-7. Aria 51 focused on music styles, music history, instrument development & rhythm tapping. The entire school sang every song beautifully. Thursday April 24th--Sunday April 27th was the UKULELE FESTIVAL at the Nugget. Rich Dann, Evan Stern, & Julie Holloman volunteered and helped during the entire festival, and Ukelear Fusion performed on Saturday April 26th at 12:00 on the public stage. At least 600 people attended this great festival. Uke on! 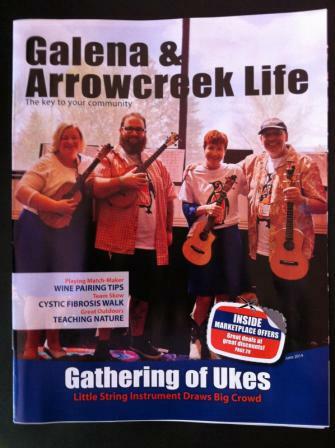 Ukelear Fusion was featured in this local magazine--Galena & Arrowcreek Life for the role they play in keeping ukulele playing in the community alive and well. Thursday May 8th--Aria 51 performed for the 26th Annual 90+ Club Celebration at the Reno Housing Authority to honor their most Senior Residents. 35 people attended this special event. Saturday May 10th--Aria hosted a workshop and mini Concert featuring Kanekoa, who were touring the west. They are a Ukulele Reggae Folk Rock Band from Hawaii. 12 of us were there to take it all in. Friday May 30th--Aria 51 perfromed at the More To Life Adult Daycare center. There were 30 residents there, and they Love 60's Rock! Friday June 20th--Aria 51 opened for the Black Lillies at the Northern Nevada Food Bank's "We Can Solve Hunger" concert. There were approximately 3,000 people in attendance. Tuesday July 8th--Aria did the annual Artown Ukulele Concert, with performances by RUG, various students, Uklear Fusion, and Aria 51. There was standing room only, which meant over 200 people attended! 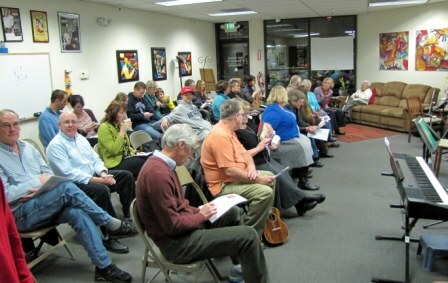 Saturday October 11th--Evan and Julie presented a Strum Workshop for Uke players. Tons of fun with 28 students! Saturday November 15th--Recital at Aria, featuring cello, guitar, piano,violin, voice, and ukulele. We heard from private students of all ages, beginning and intermediate uke classes, Reno Ukulele Group, and Ukelear Fusion. We had 60 people there, and we all enjoyed great music and munchies after! Wednesday December 17th--Aria hosted the first Holiday Party/Sing-along Open Mic Night. We had 50 people there, and we had so much fun singing, eating and visiting we decided to make it an annual event. In 2013 Aria was able to help 6 students receive private music lessons at no cost to their families. We provided books and instruments for 6 students by using instruments that were donated or purchased in past years, and by spending $208.00 for new instruments and books. We helped 1 student with group lessons at no cost to their family. We helped one family with food for Christmas dinner. We were able to reach out to at least 600 people through performing both in the school and in the community. Wednesday Jan. 9th the Reno Ukulele Group (RUG) moved their meetings to Aria, so every Wednesday from 6:30-8:30 the school is filled with the sound of singing and ukuleles playing. Rich Dann is the Grand Poobah of the group. Julie Holloman hosts, and they both join in the music-making. The group averages 8 adults, with up to 15 players at times. Thursday Jan. 24th we arranged for 6 of our guitar students to go see Tommy Emmanuel, world-class guitarist sponsored by Artown. Our students were able to go before his concert to meet and speak with him, and hear him play and talk about making music. Saturday Jan. 26th we had our first recital in our new location. The participating teachers were Rich Dann, Julie Holloman, and Eric & Evan Stern. We enjoyed performances on cello, guitar, piano, mandolin, violin, voice, and ukulele, for a total of 12 students and our Rug Rats ukulele class, which has 10 students. Our staff members each did a solo, and this was the premiere of the staff trio, Aria 51. The Trio includes Julie Holloman and the brothers Stern. There were 55 people in our audience. Friday February 15th the American Lung Association had their silent auction Fundraiser, and Aria donated a Gift Certificate for 4 music lessons to the group. Tuesday Feb 26th RUG went to Reno Lifecare to perform for the cute old folks (and young folks). The singing and ukulele playing was enjoyed by everyone, and the audience sang with the performers on almost every song. There were 60 residents and staff in attendance. Saturday March 9th Aria 51 was one of 5 groups that performed for the annual Italian Family Dinner and Variety Show in Minden. This is the main fundraiser for the Carson Valley Pops, and money from this event pays for printed music, guest artists, hall rentals and other expenses. Saturday March 23rd we had another recital. The participating teachers were Rich Dann, Julie Holloman, and Eric & Evan Stern. We enjoyed performances on cello, guitar, mandolin, violin, voice and ukulele, for a total of 11 students, the Rug Rats ukulele class, the Aria String Orchestra, and Aria 51. There were 50 people in attendance. Thursday--Sunday April 11-14 Reno Ukulele Festival and Reno Acoustic Festival took over John Ascuaga’s Nugget. Rich Dann and Doug Reynolds plan this event each year, and it’s amazing. There are workshops, vendors, and concerts going on constantly. Our RUG and Rug Rats performed on the ukulele stage, and Aria 51 performed on the acoustic stage. Julie Holloman attended every possible workshop she could get to, as did many other Aria music students and group members. Saturday May 11th we provided music for the Arts & Crafts Fair at Air Center Plaza. This fun event was sponsored by our friends at the Wet Hen Café. From 11am to 3pm Aria students and staff performed in between classes. Our Rug Rats performed, and we heard from our String Orchestra and Aria 51. Students and staff performed duets and trios, and had a great time. Saturday May 18th we had our first House Concert and Guest Workshop. We were proud to have The Quiet American (Aaron & Nicole Keim). They are a husband/wife team, and they sing and play multiple instruments, including ukulele. Aaron did a great ukulele workshop at 4:00, and then both of them performed at 7:00. We could have listened all night! We had 25 students attend the workshop, and 40 people attended the concert. Thursday May 23rd RUG performed at The Villas in Sparks for 150 residents and staff. They were having a Luau, so RUG was perfect entertainment. Once again they knew the words to each song and sang along in between bites. Wednesday June 5th we had a combination Concert/Guest Workshop by Jim D’Ville. Jim specializes in teaching techniques for playing by ear, so everyone was playing and singing by the end of the night—no music needed. We had 40 people attending. Saturday July 13th was the Aria Artown Concert. Participating teachers were Rich Dann, Julie Holloman, and Eric & Evan Stern. We enjoyed performances on guitar, mandolin, violin, voice, and ukulele, for a total of 7 students, the Rug Rats, and Aria 51. We had several Artown audience members in addition to friends and family, so it was a great evening. Saturday August 17th was the Bowers Mansion Bluegrass Festival. We had a booth promoting ukuleles, and we performed songs at our booth during breaks in the stage performances. Staff members included Rich Dann, Julie Holloman, and Eric & Evan Stern. We talked to hundreds of people about music and ukuleles. Saturday September 14th Aria proudly hosted a concert by Acoustic Solution, a wonderful family band from Minden. Their mix of classic folk, rock, and original tunes made the evening fly by. John, Wendy, and Seth Andrews each sing and play multiple instruments, so the fun never stopped. Tuesday October 1st Aria donated a gift certificate for four 30 minute lessons to the SPCA of Northern Nevada to help with their fall fundraiser. Friday October 4th Aria 51 performed for the students and staff at Marvin Picollo School. Volunteering to play in Washoe Co. Schools is one of the things Aria 51 does as part of Aria's community outreach program. There were 100 staff and students there, and they were able to play percussion instruments while Aria 51 performed. Saturday October 12th Aria donated a gift certificate for four 30 minute lessons to Wooster High School for their Quarter Auction Fundraiser. Saturday November 2nd was an Aria School Recital. Participating teachers were Rich Dann, Julie Holloman, and Eric & Evan Stern. Students performed on mandolin, violin, guitar, cello, voice, and ukulele for a total of 17 student performers, including the Rug Rats Ukulele Class. The staff Ukulele group premiered with 2 tunes. There were 50 people attending the recital. Saturday November 23rd was a House Concert Fundraiser featuring Aria 51. All of the money raised went to the instrument fund, which the school uses to purchase instruments for students to use free of charge if their families can't afford it. The band played tunes from Bach to Rock, and raised $712.00. There were 55 people attending the concert.